J. R. Huston Consulting, Inc. can provide educational seminars and hands-on training workshops for Green Industry Contractors, Associations, Manufacturers and Vendors. We can customize seminars and workshops to your needs. Either a two, four or six-hour educational event that will introduce Landscape and Irrigation contractors to the process of building a high-performance team that requires minimal supervision using Green Industry job descriptions as a foundation. This seminar is taken from Mr. Huston’s book, audio book and MS Word CD, Job Descriptions for Green Industry Professionals, which contains over ninety-five job detailed descriptions. In this seminar, the author not only introduces attendees to the ninety-seven Green Industry job descriptions contained in his book, he also explains the following. The FBI concept of profiling and how to incorporate it into your job descriptions. Why attitudes determine your company’s altitude and how to incorporate high-performance attitudes into your job descriptions. The author will make available to attendees his book, audio book and MS Word CD. 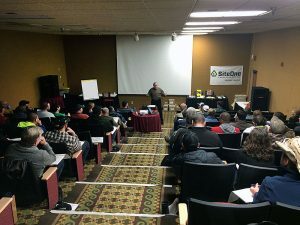 Either a two, four or six-hour educational event that will introduce Landscape and Irrigation contractors to the key components of an effective estimating system. This seminar is taken from Mr. Huston’s text and audio books, How to Price Landscape & Irrigation Projects and A Critical Analysis of the MORS Estimating System. The pros and cons of each of the six most common methods of estimating used in the market today are discussed in depth. Attendees will also be provided with numerous handouts and visual aids. The author will make available a free copy of his audio book, A Critical Analysis of the MORS Estimating System, to attendees. A two or four-hour educational event outlining the six most commonly used estimating methods currently being used in the Green Industry. This seminar is taken from the author’s text and audio book, A Critical Analysis of the MORS Estimating System. Mr. Huston uses numerous illustrations and mathematical models as he illustrates the flaws and false mathematical assumptions in these various estimating systems. Either a two, four or six-hour educational event based on Mr. Huston’s book on survival techniques for contractors, Preparing for & Responding to a Down Economy. 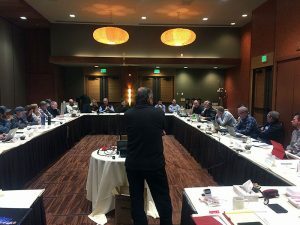 As he dissects and analyzes the four major functional areas of a landscape and irrigation company, Mr. Huston utilizes a unique and industry-specific approach to the philosophies, methodologies, systems, and strategies that every company needs to implement in order to survive. Those who attend will be provided with numerous handouts and visual aids. A two or four-hour educational event based on Mr. Huston’s first book, Strategic Planning for Landscape & Irrigation Companies. The seminar will thoroughly explain the Strategic Planning process. Material will be provided (handouts and diagrams) that will help participants to devise their own Strategic Plan for their company or division after they attend the seminar. In addition, for a period of thirty days after the event, FREE support (via telephone) will be provided to attendees who may have further questions regarding the Strategic Planning process. If it ain’t strategic, it ain’t planning! Most men find themselves straightening deck chairs on the Titanic as it is sinking. That’s why I wrote my first book, Strategic Planning for Landscape & Irrigation Contractors. We get lost and all wrapped up in the minutia of the business cycle. It’s all about priorities, seeing the big picture while you work the details. A friend of mine once played a practical joke on a buddy who was celebrating his birthday. My friend bought two different puzzles. However, before giving one of them to his buddy, he switched the puzzle box tops. You can imagine the confusion as the buddy tried to figure out how to place the hundreds of puzzle pieces in the right position. This is what happens to many Landscape & Irrigation contractors. They don’t have the right box top (the right big picture) that helps them to deal with all of the little pieces of their businesses. You will receive a free CD with a Strategic Plan outline that you can use to create your own plan. You will receive feedback from Jim Huston after you write your strategic plan and email it to him. Train you and your team how to implement the Strategic Plan as a vital and dynamic management tool. By the end of the day, each company will have put together their own, specific Strategic Plan. Either a two, four or six-hour educational event based on Mr. Huston’s four text and audio books, How to Price Landscape & Irrigation Projects, A Critical Analysis of the MORS Estimating System, Job Descriptions for Green Industry Professionals and Benchmarks for Landscape Construction. Either a two or four -hour educational event based on Mr. Huston’s two text and audio books, How to Price Landscape & Irrigation Projects and A Critical Analysis of the MORS Estimating System.